Elmer Kelton (1926-2009) was an American author of western fiction in addition to being a journalist. He was voted as the greatest western writer of all-time by the Western Writers of America. Elmer wrote the Texas Tradition and Texas Rangers series. Elmer’s novels were set in Texas – the state he called home. He received his Bachelor’s degree in journalism from the University of Texas at Austin and then served in the U.S. Army during World War II. 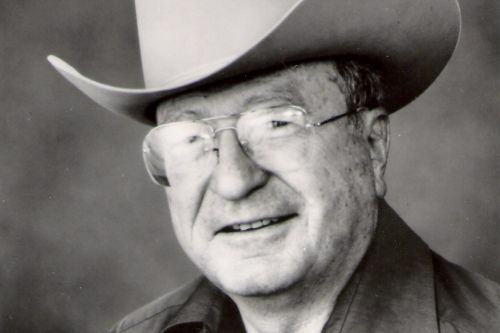 Elmer was an eight-time winner of the Spur Award as well as a three-time winner of the Western Heritage Award. In the midst of writing a novel, Kelton passed away of natural causes in 2009. Notes: Joe Pepper, Long Way to Texas and Eyes of the Hawk were written as Lee McElroy. Shotgun Settlement was written under the pen name of Alex Hawk. The Funeral of Tanner Moody was written with John Jakes and Robert J. Randisi. Noah’s Ride is a collaborative novel that also contains contributions by Phyllis Allen, Judy Alter, Mike Blackman, Mike Cochran, Jeff Guinn, Mary Dittoe Kelly, James Ward Lee, James Reasoner and Mary Rogers. Legend is co-authored with Judy Alter, Jane Candia Coleman, Loren D. Estleman, Ed Gorman, Robert J. Randisi and James Reasoner. Lost Trails also contains contributions by Loren D. Estleman, William W. Johnstone and Louis L’Amour. The Sons of Texas series was written as Tom Early (with James Reasoner). Elmer Kelton Synopses: The Good Old Boys is the first novel in the Texas Tradition series in chronological order and the fourth novel to be published in the series. The novel follows Hewey Calloway in West Texas in the year 1906. Hewey only wants to be a cowboy, while he watches the Old West he knew and loved become modernized. He comes to realize that every choice he makes requires a sacrifice. The novel was adapted into a TNT made-for-TV movie starring Tommy Lee Jones. Shotgun was the final standalone novel that Elmer Kelton completed. Blair Bishop makes his living as a rancher in Two Forks, Texas. He is a man who with enemies – the recently released from prison Macy Modock and a rival cowman named Clarence Cass. To make things worse, Cass’ daughter, Jessie, and Bishop’s son, Allan, are in love. Can Macy Modock and Clarence Cass form an alliance in order to ruin Blair Bishop’s life?